Stock Up for Storms with Us! Posted September 22, 2016 by werlingadmin & filed under Canned Meats. As the fall and winter seasons slowly transform the atmosphere into a volatile, unstable mix of unpredictable weather, preparation is key to being ready for whatever Mother Nature sends your way. Fall and winter storms bring with them the change for falling tree limbs, flying debris, heavy snowfalls and perhaps most importantly, power outages. Depending on the severity of the storm, once your house loses power, you could go hours or even days without electricity. No power most obviously means zero lights, but there is something else more pressing to worry about: refrigeration. Without refrigeration or if you find yourself snowed in for a few days, your food supply becomes pretty limited. While you could choose to eat fast food every day for a few weeks – if you can get out – there is a healthier, tastier solution: high-quality canned meats from Werling & Sons! Providing the products you need to survive the storm since 1886, Werling & Sons offers canned beef, chicken, turkey, pork, goetta and seasoned barbecue pork at affordable prices to customers across the country. 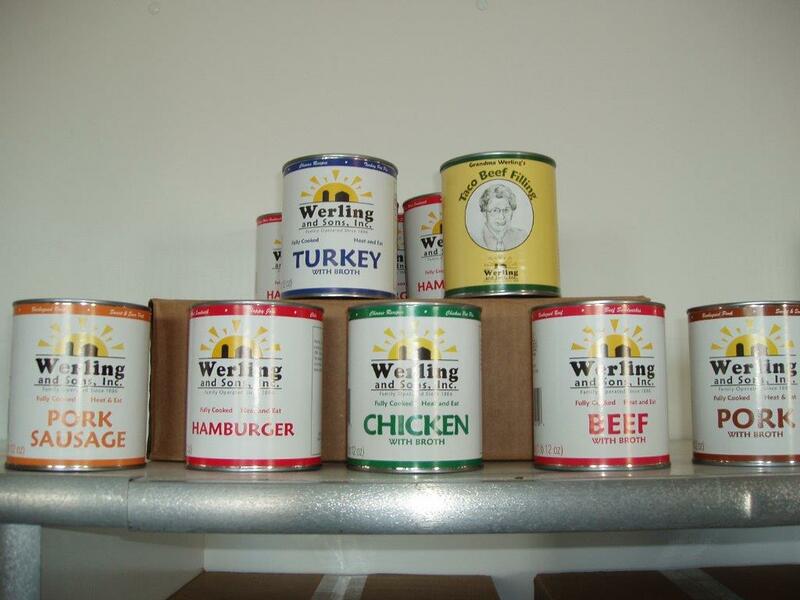 Family owned and operated, Werling & Sons is a fourth-generation company, and our selection of canned meats offer a great meal option whether you’re facing a power outage, in a hurry for a quick dinner or snack, or need something portable to take camping. Stock up on our premium and great tasting meats today before the storms start to brew, choosing from a wide array of available products including hamburger, seasoned pork and taco beef filling. Under proper storage conditions, you can expect our non-refrigerated products to last a whopping five years or longer. As long as the integrity of the can appears strong, the product inside will continue to taste delicious. All of our canned meats contain no preservatives and have low fat content, and we even offer a variety six-pack or 12-pack selection to give you several different options, or you can stock up on your favorite kind – the choice is yours. Don’t get caught in a power outage or long winter storm without suitable options for food. Place an online order from Werling & Sons today or stop by our store in Burkettsville, Ohio to stock up!